As part of the week of celebrations for the 40th anniversary of the Sydney Opera House, Crown Prince Frederik and Australian born Crown Princess Mary of Denmark visited the Harbour City to honour the Danish architect Jørn Utzon’s crowning achievement. In cooperative effort between SBS, the Danish Broadcasting Corporation, the royal couple and the charitable Bikuben Foundation, their Highnesses presented the annual Crown Prince Couples Awards at the Joan Sutherland Theatre, the first time the awards ceremony has been held outside its native Denmark since its inception in 2004. The awards were established by the Bikuben Foundation as a wedding gift for the royal couple and celebrate Danish excellence in arts, culture and society. The creative teams behind the television series The Killing and Borgen received the Cultural award, while violinist Rune Tonsgaard Sørensen and singer-songwriter MØ aka Karen Marie Ørsted both received the Rising Star award for young musicians. Volunteer organisation Natteravnene (Night Owls) received the Society award for their work with young people. Australia’s Gurrumul and Diesel performed alongside 2013 Rising Star winners and past winner Oh Land, while Julia Zemiro co-hosted. Lighting Director Gavan Swift was tasked with bringing the ceremony in on top of current show-in-residence South Pacific. 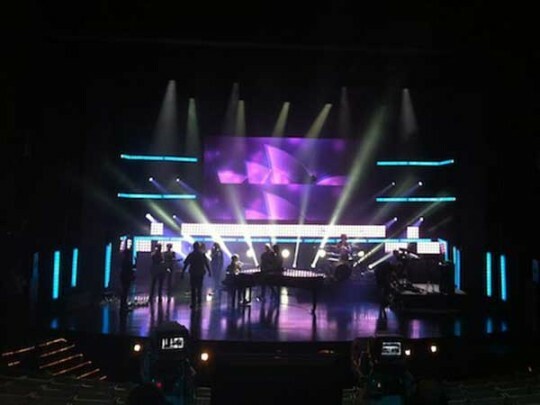 The Sunday before the show saw the crew stripping out part of the musical’s set, bringing in a semi-trailer full of extra lighting from Chameleon and setting up a “black box” TV studio environment with trussing and black masking. With no pre-programming time, Gavan came in at 7 AM on the morning of the ceremony, exported a CSV file from South Pacific’s ETC Eos and imported the patch into the L5. He plugged the Vista into the theatre’s Ethernet network and had complete control of South Pacific’s channels. Rehearsal started at 9 AM, and Gavan began with no cues built. “The lighting was the set” explained Gavan. “Because we created a black box environment, the lighting became the background for all the camera shots.” With the combination of time pressure and with the lighting doing dual duty as set, the Vista L5’s ergonomics and speed of workflow were integral in getting the show up to international broadcast standard.